A phone phreak is someone who loves exploring the telephone system and experimenting with it to understand how it works. Phone phreaking got its start in the late 1950s. Its golden age was the late 1960s and early 1970s. What did phone phreaks do? Phone phreaks spent a lot of time dialing around the telephone network to understand how the phone system worked. They listened to the clicks and clunks and beeps and boops to figure out how calls were routed. They read obscure telephone company technical journals. They learned how to impersonate operators and other telephone company personnel. They dug through telephone company trash bins to find "secret" documents. They solved puzzles. They snuck into telephone company buildings at night and wired up their own telephones. They soldered. They built clever little electronic devices called blue boxes, black boxes, and red boxes to help them explore the network -- and make free phone calls. They hung out on early conference call circuits and "loop arounds" to communicate with one another. They wrote their own newsletters to spread information. Some used their blue boxes to wiretap people. Many were investigated by the police and FBI. Some were arrested. Some informed on their friends. A few went to prison. So phone phreaking was illegal? Exploring the telephone network wasn't (and isn't) illegal, in and of itself. But phone phreaks sometimes used their skills to make free telephone calls, and that was illegal. Additionally, some phone phreaks wiretaped telephones or stole telephone company equipment, which also got them into hot water. In the 1970s the term phone phreak started to become synonymous with anyone who stole telephone service. Because of this the phrase "phone phreak" has two meanings. On the positive side it describes somebody who is curious about the telephone network and likes to explore it. On the negative side it means somebody who likes to "break into" or abuse the telephone network or makes phone calls without paying. So phone phreaks are kind of like computer hackers? Yes! The word "hacker" originally meant somebody who enjoyed exploring, playing with, or learning about computers. Like "phone phreak," it later shifted to have a negative connotation: somebody who breaks into or abuses computers. Interestingly, the first mention of the word "hacker" in its modern context was in a 1963 MIT student newspaper article about students hacking the telephone system! Are there still phone phreaks today? Yes. As long as there are telephones there will be phone phreaks. Techniques have changed over the last 40 years (blue boxes don't work anymore, for example), but the elemental urge to understand and explore the telephone network seems to be deeply rooted -- especially in teenage boys and young men. Why did you write a book about this? First, it's interesting. It's a fascinating intersection of people, motivations, psychology, problem solving, illegality, technology, networks, suspicion, and betrayal. It was a hobby for some and an obsession for others. The mob was even involved at one point! Second, it's important. 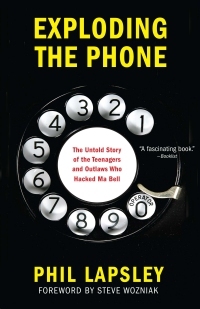 Phone phreaks (and the telephone company employees who dealt with them, along with law enforcement) were some of the first people to grapple with thorny problems in computer and network security, wiretapping, and privacy. All of these issues are directly relevant to our society today. Third, it's largely untold. Nobody has written the definitive history of phone phreaking. While there were newspaper and magazine articles in the 1970s when phreaking was in its heyday, most of them were incomplete or technically or historically inaccurate. I hope to fill this gap. Glad to hear it. It is availble in bookstores and on-line: Amazon, Barnes & Noble, Books-A-Million or from your favorite local bookstore (maybe via Indiebound). Want a signed copy? Come to see me in person in February or March on the book tour and I'll sign whatever you put in front of me (so long as it's not legally binding). You can also join my email list to keep up to date on the latest developments. (The email list is super-low volume — we hate spam as much as you do — and you can unsubscribe at any time.) To join, click here. You can also follow me on Twitter or like me on Facebook. Finally, you can check out my blog at http://blog.historyofphonephreaking.org.